SVS-Vistek adds to its extensive industrial camera range of high-resolution USB3 cameras with small-form factor: In the first quarter of 2019, the company will be introducing ten new USB3 models of the EXO camera series (exo342, exo387, exo367) with their resolutions of 31, 19 and 17 megapixels that are all based on the newest generation of Sony’s Pregius 2 CMOS sensors. These new sensors with large, square pixels of 3.45 x 3.45 µm edge length are very light sensitive and offer an extremely high dynamic range. 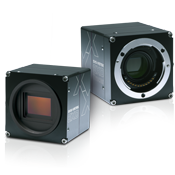 The CMOS sensors of the EXO Series can be operated with numerous cost-effective lenses. With their front-panel section of 58 x 58 mm, the new product introductions ideally cover sensor sizes up to APS-C and Four-Thirds. For the high resolutions, one can also choose from variations in the EXO Series of the M42-Mount as well as the SVS-Vistek supported MFT-Mount for focusable lenses. The large pixel size of 3.45 x 3.45 µm works well with our wide-selection of excellent lenses from which you can choose to ensure the right optic for your application – enabling cost-effective solutions from a single source. Despite their high resolutions, the new EXO camera models allow for a maximum USB3 bandwidth of 360 MB/s net. Frame rates of 11.5 images/s, 18.5 images/s and 21.5 images/s can be reached. The image transmission time is thus correspondingly short and allows enough margin for the subsequent image analysis until the next production cycle or object. Even higher frame rates will be reached in Q2 in the HR Series with the high-performance interfaces 10 GigE and CoaXPress. In addition to the impressive camera performance, the highly integrated cameras of the EXO Series offer an integrated 4-channel strobe controller that saves the user the need for an additional device, thus decreasing costs. Extensive sequencer functions, the specially milled case with extraordinary sensor and adjustment quality, as well as an excellent temperature management ensures consistent results over a wide temperature range. In special Tracer versions of the EXO cameras, MFT lenses (Micro-Four-Thirds) can be cost-effectively controlled by GenICam commands and allow focus, zoom, and iris to be reset for new tasks within milliseconds. These tracer variants take over the complete control of the lighting and lens. All timings for sensor, lighting and lens come out of the camera and are controlled by a single GenICam interface. The user therefore benefits from a fast and efficient integration into the application, as with all EXO models. The new generation of Pregius sensors from Sony will be available in the first quarter of 2019, and the SVS-Vistek cameras based on them will be released at the end of Q1. The compact footprint and outstanding picture quality make these new cameras optimal for many high-resolution applications, among others in the branches apparatus construction, traffic technology, photogrammetry, surveying, aerial mapping, high-end security technology as well as for the inspection of solar panels, wafers and displays.